We offer a range of simulation solutions from provision of NATS’ own ACE simulator through to a full simulation package including simulator, courseware, data preparation, pseudo-pilot solutions and training for local staff to deliver these services in-country. NATS training creates complex and operationally realistic exercises. 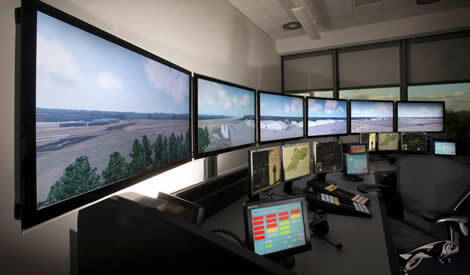 Our ACE simulator is a scalable air traffic control simulator capable of emulating or interfacing to operational systems to produce ultra-realistic simulations of operational environments. The Aerodrome solution uses an industry leading 3D solution from Presagis and can be configured to deliver simple three-screen 120° panning views through to 360° capability. Data preparation is the key to successful simulation, and this can be delivered by NATS or local staff trained with support from NATS to create complex and operationally realistic exercises. Our pseudo-pilot solutions range from provision of our own staff to support your simulation through remote provision of this service on a ‘power by the hour’ basis We can also train local staff to deliver these services, and also deliver a voice recognition solution to enable low cost effective training.